Although Crumhenge does not have a mysterious underlying purpose, it is still a fascinating spectacle, especially when standing on the hilltop overlooking the meadow. Steve Wheaton, who was the Director of Grounds at the time, installed Crumhenge in the 1980s. The original Crumhenge had a graveyard-like quality with thin, tall rectangular rocks standing upright and four boulders indicating the four compass directions. Around these rocks marking north, south, east and west, several other rocks were arranged to form a circle. 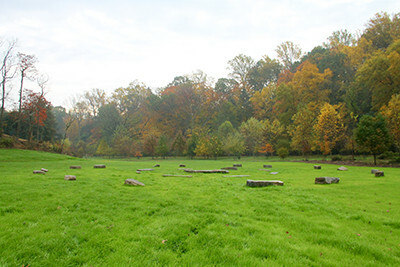 Crumhenge has existed primarily for the enjoyment of Swarthmore College students, who often use the fire pit for bonfires. Unfortunately, due to the SEPTA trestle construction, Crumhenge was deconstructed in 2015 so the boulders would not be damaged. This fall, the original Crumhenge was reconstructed with all the boulders lying flat on the ground. Two concentric circles replaced the original circle; one hugs the fire pit for close seating around the fire, and the other rests several paces outwards. The original stones were used, but additional stones from the Crum Woods were added to create the final arrangement. You can reuse and redesign parts of your garden by moving plants and hardscaping elements around to add an entirely different aesthetic to the garden. Landscapes are not set in stone; consider refreshing a tired corner of your garden as a New Year resolution. Fascinating article. Loved the “set in stone” comment too! Thanks! Thanks Becky. Alexis had run writing this one. Got to love Jeff’s humor.